Had To Be Ivory, under jockey Tony Phillips, setting the fastest time in the $75,000-added lex Picov Memorial Futurity trials at Ajax Downs Monday afternoon. AJAX, ONT�SEPTEMBER 18, 2017�Had To Be Ivory, a stakes winning son of multiple stakes sire IVORY JAMES defeated the royally-bred Aj Chick In 15 by 1-� lengths Monday afternoon at set the fastest qualifying time for the Alex Picov Memorial Futurity at Ajax Downs. The 10 fastest qualifiers will return to the Ontario Canada racecourse on Monday, October 9th to vie for the winner's share of a $75,000-added purse going 400 yards. Ridden by jockey Tony Phillips, Had To Be Ivory completed his 400-yard task in a quick :19.940 clocking to earn a 101-speed index with a 4-mph tailwind. It was the fourth win in as many starts for the 2-year-old. 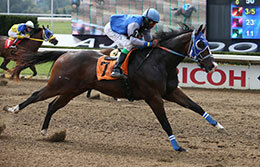 Bryn Robertson trains the Ontario homebred for Carol and Jaime Robertson. Out of the stakes winning Hadtobenuts mare Had To Be Fandango, Had To Be Ivory won the John Deere Ajax Juvenile Challenge and has banked more than $29,000. Six of the 10 qualifiers came from the opening trial including second fastest qualifier Aj Chick In 15, who finished anther 1-� lengths ahead of the field.